Update 3:04p.m. : Omar apologized for her comments in a Monday afternoon tweet. House Democratic leaders issued a joint statement Monday calling on Representative Ilhan Omar (D., Minn.) to apologize for endorsing the "anti-Semitic trope" that Jewish donors leverage their wealth for nefarious political purposes. "Legitimate criticism of Israel's policies is protected by the values of free speech and democratic debate that the United States and Israel share," read the statement, which was signed by Speaker Nancy Pelosi, Majority Leader Steny Hoyer, and other Democratic leaders. 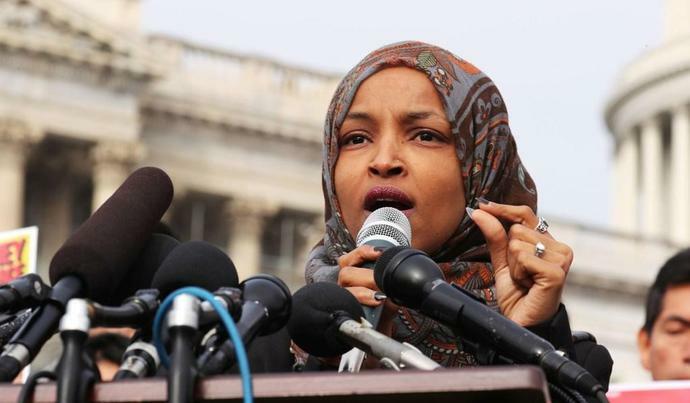 "But Congresswoman Omar's use of anti-Semitic tropes and prejudicial accusations about Israel's supporters is deeply offensive. We condemn these remarks and we call upon Congresswoman Omar to immediately apologize for these hurtful comments." The statement was issued in response to a tweet Omar sent Sunday, in which she suggested her colleagues' support for Israel could be attributed to the financial influence of Jewish donors and groups like the American Israeli Public Affairs Committee (AIPAC). Omar's comments were met with swift condemnation from lawmakers and activists on both sides of the aisle. Representative Jerry Nadler (D., N.Y.), who chairs the House Judiciary Committee, called Omar's comments "deeply disturbing" and, in an effort to expose Omar's pattern of behavior, cited a previous tweet, for which she has since apologized, accusing Israel of "hypnotizing the world." "It is deeply disappointing and disturbing to hear Representative Ilhan Omar's (MN) choice of words in her exchange with a journalist yesterday, wherein she appears to traffic in old anti-Semitic tropes about Jews and money," Nadler said in a statement. "Her words are deeply hurtful and offensive, particular as they build on previous comments she made about Jews 'hypnotizing' the world in support of Israel - another old trope born of hate-filled texts like the Protocols of the Elders of Zion." "I fully expect that when we disagree on the Foreign Affairs Committee, we will debate policy on the merits and never question members' motives or resort to personal attacks," Engel said. "Criticism of American policy toward any country is fair game, but this must be done on policy grounds." Omar was previously criticized over her ties to anti-Semitic Palestinian activists, one of whom served as a top fundraiser on her recent congressional campaign, and has expressed support for the Boycott, Divestment, and Sanctions (BDS) movement, which seeks to challenge Israel's occupation of the West Bank through financial pressure. An architect of a still-secret U.S. plan to end the Israeli-Palestinian conflict took to Twitter again on Wednesday to disclose another element that it would not contain - a confederation with neighboring Jordan. U.S. President Donald Trump's Middle East envoy, Jason Greenblatt, had already tweeted "False!" on Friday to what he said were reports that the proposal would give part of Egypt's Sinai desert to the adjacent Palestinian enclave of Gaza, which is ruled by the Islamist Hamas group. On Wednesday, Greenblatt denied that the plan envisages a confederation involving Jordan, Israel and the Palestinian Authority, which administers limited self-rule in the occupied West Bank. At a meeting of House leaders earlier this month, Judiciary Committee Chairman Jerrold Nadler suggested fining officials personally if they deny or ignore subpoenas, according to a person who attended the meeting. Nadler even mentioned jailing administration officials as a consequence for contempt of Congress, though he surmised such a plan might be unrealistic, added the person, who requested anonymity to discuss a closed-door session. The person said the idea surprised many in the room but seemed to have been researched as a serious option by Nadler or his staff.